June is a tough month for racing on the East Coast. The DC region's swampy humidity rematerializes seemingly overnight, so if one has an itch for a fast race, there's going to be some travel involved. Among recent trips to Belgium, Canada, and Oregon, our harriers have racked up a considerable amount of airline miles in pursuit of late- (or early?) season glory. Furthest from our nation's capital, distance hurdling queen Emily de la Bruyere logged an eye-popping 10:02.36 in the 3k steeplechase at the IFAM Outdoor "Meeting" on 5/27. Emily d impressively held her own against a deep field despite having logged zero barrier jumps in over a year. Coach Jerry was particularly pleased, reporting that "to my knowledge, this was the first steeple ever run by a man or woman in a GRC jersey (which is somewhat surprising since we have 3 athletes who were Division I All-Americans in the steeple, and a 2-time Division III champion). [It] goes without saying this was a club record, and Emily has set the bar awfully high. Well done!" Emily will take an honest crack at qualifying for nationals once she's back stateside later this month. She currently holds the 28th fastest US time heading into the second week of June. 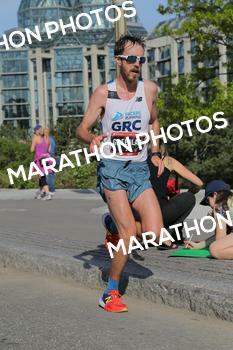 Across the Canadian border, Outlaw completed the Ottawa marathon in 2:30:39 for 36th overall. Outlaw spent the majority of his successful spring campaign focusing on shorter-distance races, so his preparation for the marathon distance was admittedly limited. Coach Jerry explained further, "Outlaw's lack of high mileage showed in the last miles when he slowed to 6 minute pace, but he competed to the tape, and passed several competitors in the final 2k. Outlaw had an excellent season, and I am more convinced than ever that he is a legitimate contender to qualify for the 2020 Olympic Trials." 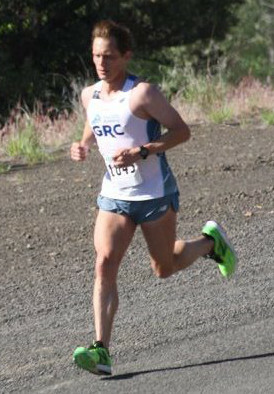 Charlie Ban, who is known for his strong aversion to DC humidity, chipped away at his summer racing quota by running in the Eastern Oregon Half Marathon on Sunday and the Miles On Memorial 15k across the state on Monday. According to Coach Jerry, "the half was run in conjunction with the 'One and Only Spray Rodeo,' and befitting a race that is second fiddle to a rodeo it was not competitive, but Charlie got in a good solo effort on a challenging course, running slightly under 1:17. Surprisingly, the 15k in Eugene was no more competitive than the half, and Charlie ran 52:34, and won by over 5 minutes." Hopefully Charlie brought home a pair of nice trophies to add to his impressive collection. Closer to home in Fairfax VA, Jesse Carlin continued to sharpen up for the summer track circuit by running 2:12.03 for 800m at the PVTC All-Comers Meet. According to Coach Jerry, "It was a solo effort, as two men broke 2 minutes, and the guy behind Jesse didn't break 2:18. Jesse is continuing to get race fit, and in more competitive fields at upcoming meets, she'll run much faster."